He made us from this. This darkness, this ancient batter of living and dead and living again things. I like that God made us from dirt, instead of from nothingness. I like that we walk earth’s surface until the soil fills our mouths with forgotten stories and the roots clasp our hands. Today I simply dig in it. The smell of my garden is like summer darkness, and I breathe it in while I kneel beside my flowerbed, shoveling uneven holes for the dirt cubes of the pink petunias. I taste the mustiness when I lick my lips. I wipe black across my brow when the work is done. I like that the soil gets under my fingernails, like Adam must have gotten under God’s nails as he scooped together the lovely black mounds. He tasted his eternity in the flesh when he licked his lips. As I plant, my neighbor walks out onto her adjacent condo patio to watch me. Some of us have a small space we fill with hostas and tomatoes in pots. My neighbor used to raise roses when she was married and had a yard, but this spring she could hardly plant a few flowers in the mud-spattered boxes outlining her small concrete slab. I offered to plant for her, but she wanted to do it herself, even if it killed her, she insisted. She is dying from fifty years of smoking and misses the smell of roses. “Planting gives me joy—” Her voice is snipped off by sudden sadness. She wipes tears away with her thumb. I am sitting on the edge of my patio with a hanging basket held between my bare feet to steady it as I fill it with petunias. They will grow in any weather and won’t mind my shady porch so much. My neighbor breathes in through bits of lung and begins to tell me about her niece. The woman has had three miscarriages and recently gave birth to twins three months prematurely. Noah and Michaela are only about four pounds all together now. “I needed a new addiction, so I started knitting blankets for the babies.” As a young nurse, my neighbor had to learn to knit so she could teach the residents in the psych ward. Knitting kept them calm. You are putting your energy, your prayers into those blankets, I say. 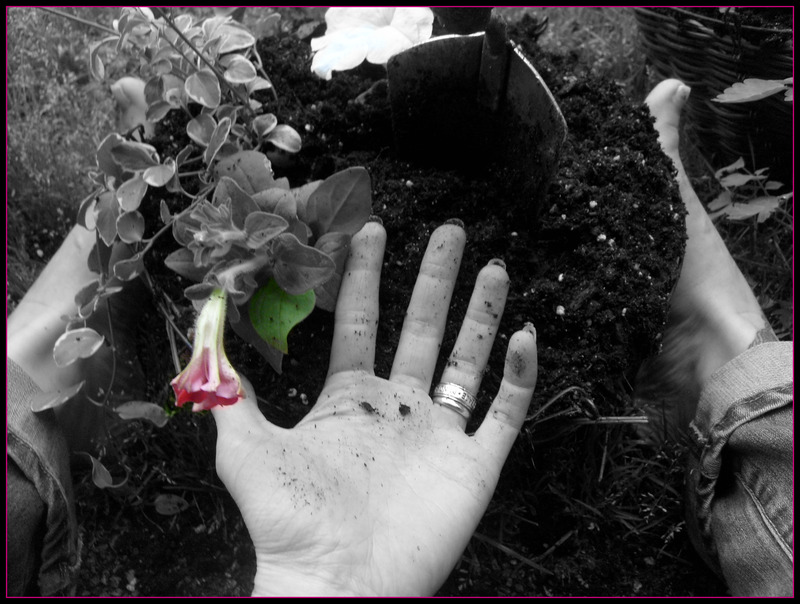 As she talks about God and praying for the babies, I plant another pink petunia. I am planting this one for the tiny boy. If I keep the flowers alive, the babies will stay alive. I’m going to nurture life in their honor. I’m going to pray for them to grow. She wipes her eyes again and thanks me for my assurance to pray that they live and that their parents will somehow live through it, then she goes back inside to her knitting. I continue to plant, beautifying this small plot of earth. I tuck in another petunia next to Noah’s for Michaela and look forward to watering them. For his own reasons, God made those babies. He got them under his fingernails. He rejoiced over the dust he breathed in, the feel of their grit on his lips. He enjoyed having them in his garden, putting his energy and love into those creations. Some might say they weren’t finished. But God planted them where only that mother and that father could nurture them. For however long a season.